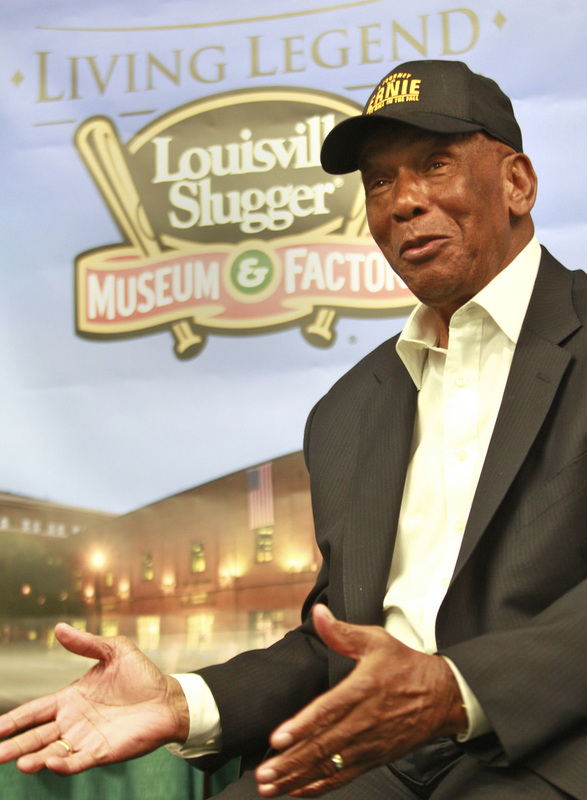 The Louisville Slugger Museum & Factory recognized Baseball Hall-of-Famer and beloved "Mr. Cub'' Ernie Banks with its 2010 Living Legend Award on November 12. Banks was honored and presented the award during a special recognition ceremony that kicked off the Seventh Annual Louisville Slugger Museum & Factory Auction. The Slugger museum is known as the “cradle of power” for the majority of modern era baseball players. In fact, the majority of the many thousands of home runs hit since the inception of the MLB were launched by a Louisville Slugger baseball bat. "Ernie Banks is known not only for being one of the greatest players of all time, but also one of the nicest and most caring players in Major League Baseball," said Anne Jewell, Executive Director of Louisville Slugger Museum & Factory. "The Living Legend Award recognizes greatness both on and off the field and Ernie Banks played the game with character and pride throughout his entire career. We are thrilled to honor "Mr. Cub" as our 2010 Living Legend," she said. Banks has remained loyal to the game he loved. He is actively involved as an unofficial ambassador for Major League Baseball, and together with his wife Liz founded The Ernie Banks Live Above & Beyond Foundation™ (www.eblaab.org). The foundation serves to promote social welfare, and improve and develop the capabilities of children and seniors who are underprivileged residing in disadvantaged neighborhoods with donations to programs that enhance neighborhoods, eliminate prejudice and relieve discrimination among various age groups and races. Ernie Banks' passion to help underprivileged youths and disadvantaged seniors, inspired Louisville Slugger Museum & Factory to produce a limited edition S2 model collector bat autographed by "Mr. Cub". Past recipients of Louisville Slugger Museum & Factory's Living Legend Award include Hank Aaron (2009), Frank Robinson (2008) and Ken Griffey, Jr. (2007).